Visual Puzzles are to test your observational skills. There are many different types of visual puzzles. These puzzles does not require any of your Mathematical or Logical skills to solve these puzzles. However you should have good eye sight to observe things carefully. One of the visual puzzle type is hidden object picture puzzles. In these hidden object picture puzzles, something is hidden in the photo puzzle pictures. Your challenge is to find these hidden objects in these given puzzle picture images. 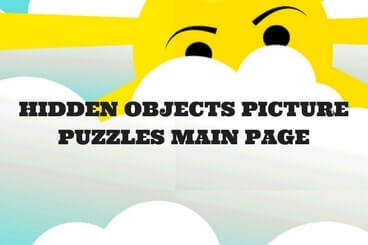 Most of the times the name of the hidden objects is given at the top of the puzzle picture images. Here is the index of these picture puzzles in which something is hidden. Do click on these links to go to the corresponding puzzle pages. Can you find the hidden faces?